More dates are available on the Calendar page. 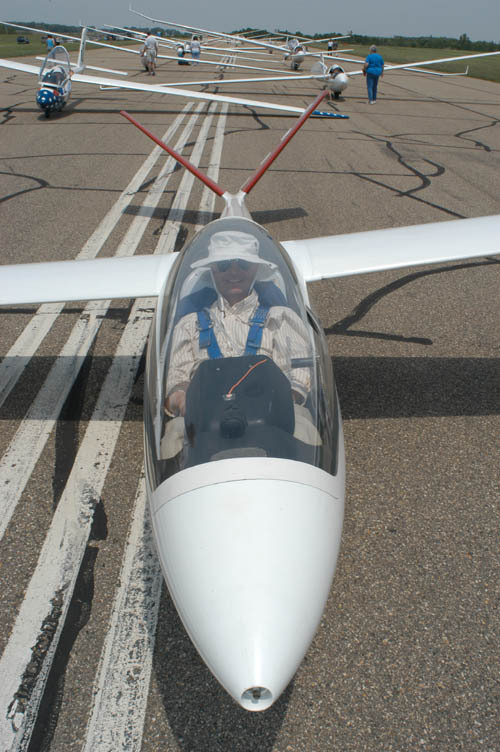 The photos below are from the 2007 Albert Lea Soaring Contest. Click on the images to see medium resolution versions. They were taken by Paul Remde. Full resolution versions of these photos, plus hundreds more, are available on 3 CDs for $30. You can order the CDs here: . The photos below are from the 2005 Region 7 Contest at Albert Lea. Click on the images to see medium resolution versions. They were taken by Paul Remde, Mike Newman, Eric Strandjord and Scott Elhardt. Below are some photos from previous contests at Albert Lea. More great photos are available in the photo pages from the 1997 15m Nationals and the 1995 Sports Class Nationals. Click on the images to view larger versions. This promises to be a very exciting contest! 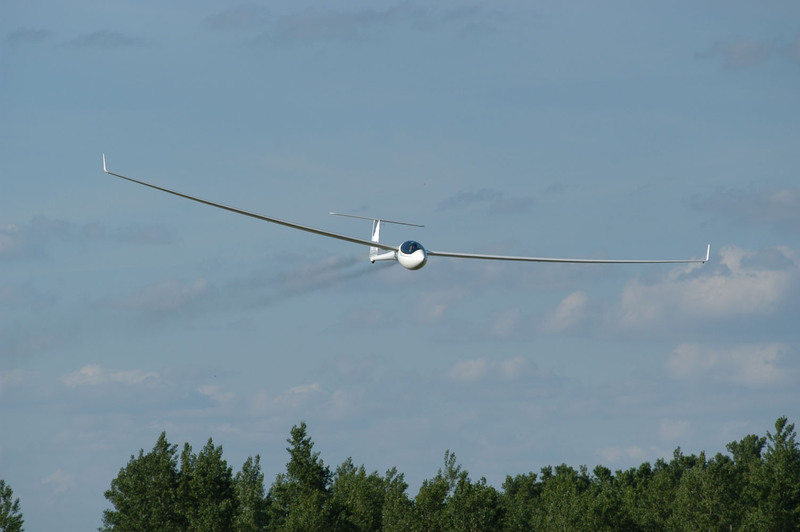 It is the largest soaring contest ever held in Minnesota with 65 gliders competing. 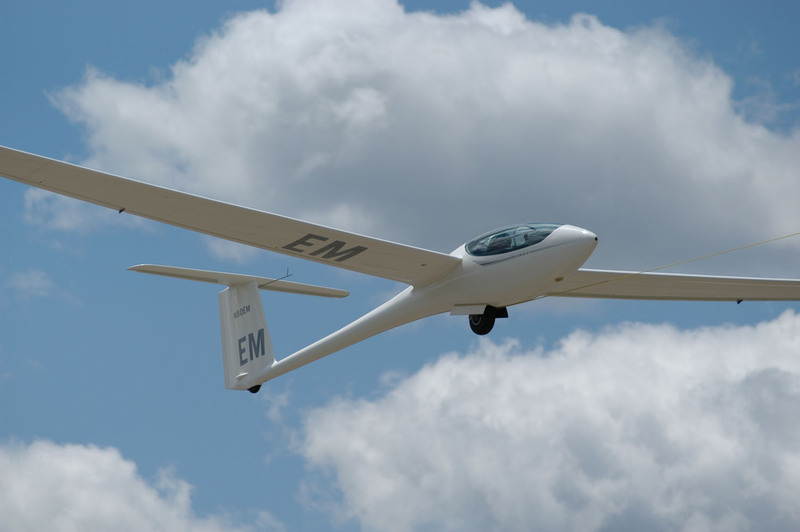 Many of the world's best glider pilots will be competing for national titles in the Open and 18 m classes. 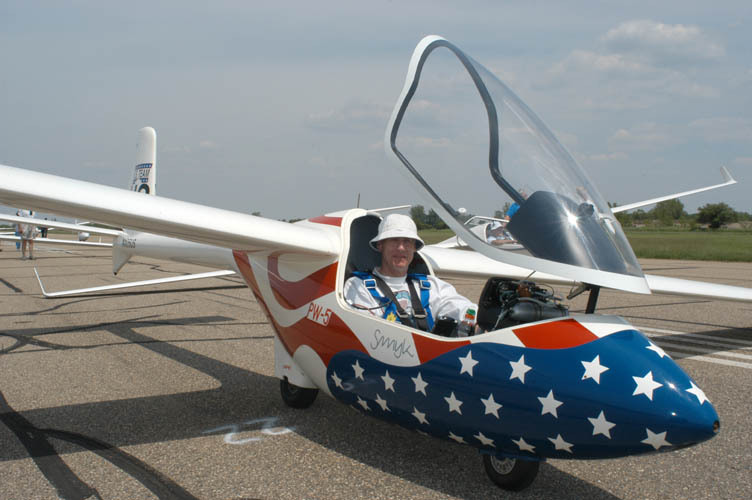 Pilots are coming to Albert Lea from all across the US and Canada and one participant is from the United Kingdom. 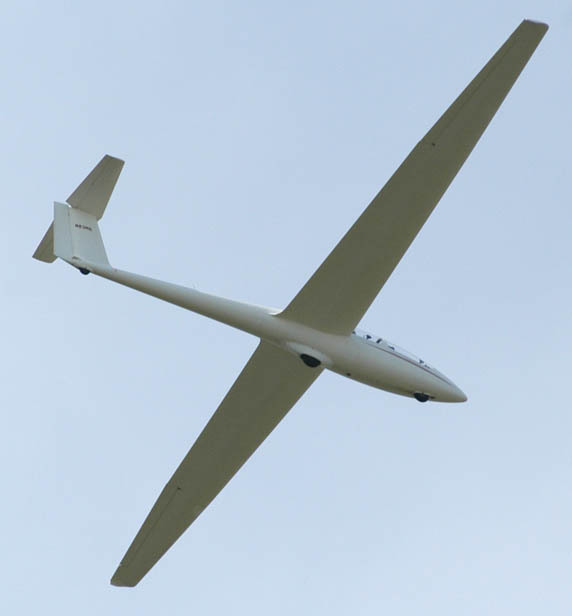 What is a Soaring Contest? 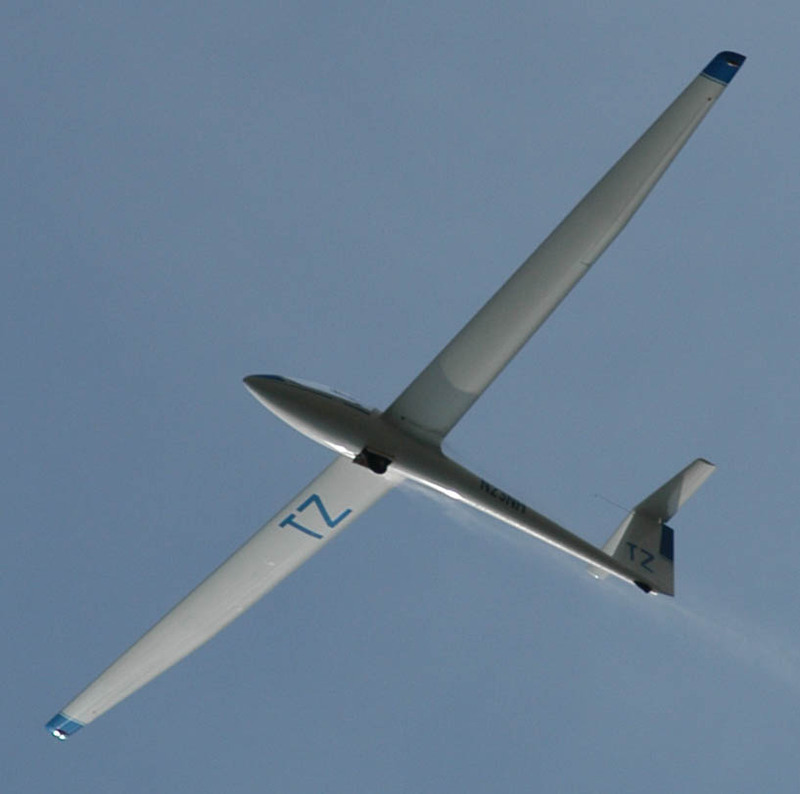 Sailplane racing is a very challenging and rewarding sport - very much like sailboat racing. Each day we will launch sometime between 11 AM and 2 PM using 5 towplanes. 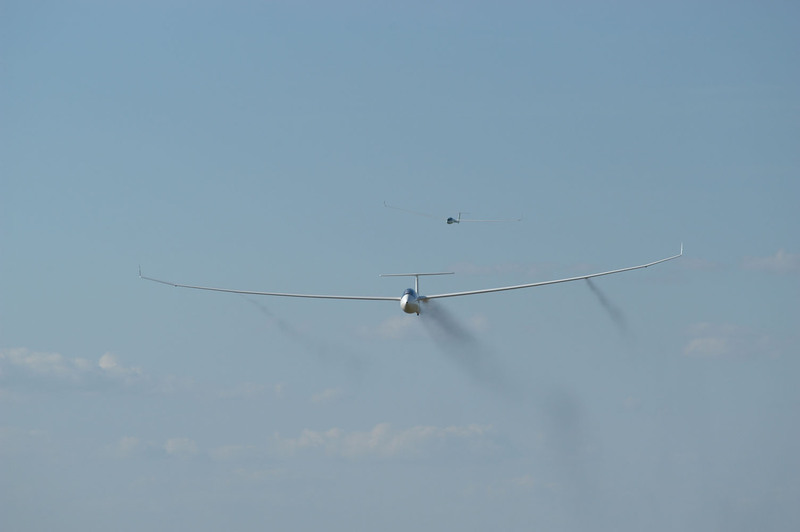 That is the busiest time of the day and all the gliders all launched in about 1 hour. 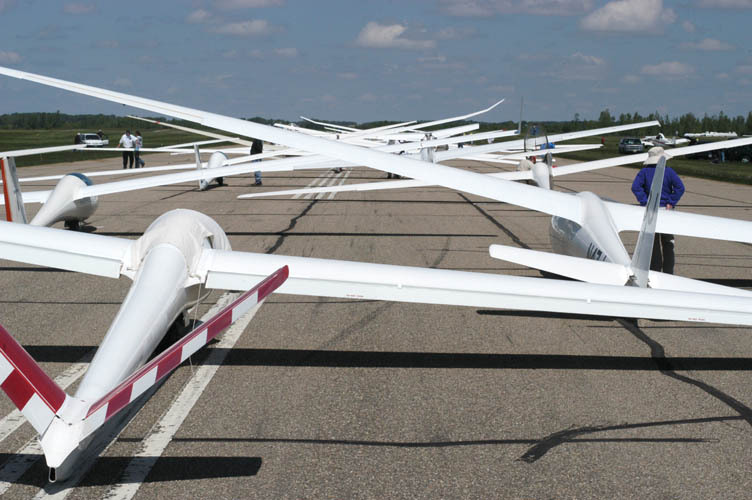 The best time to see all the gliders on the runway is immediately before the launch begins. 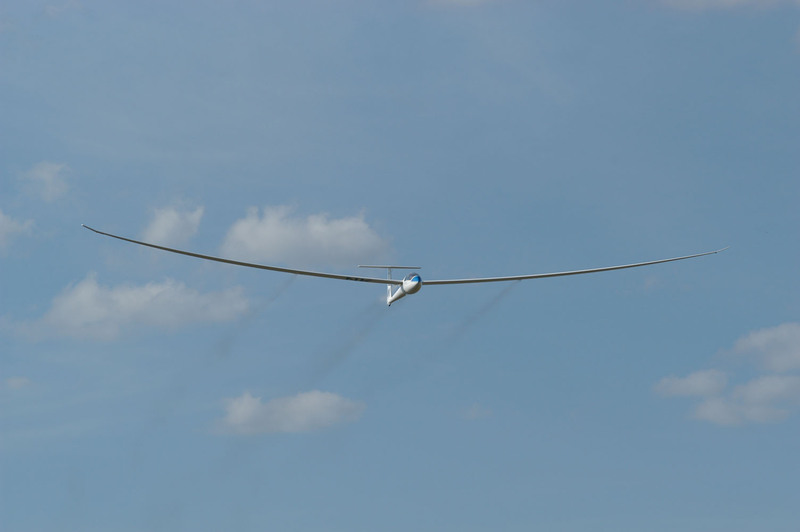 Each competitor is towed to 2000 feet above the airport where the glider pilot releases the towrope. 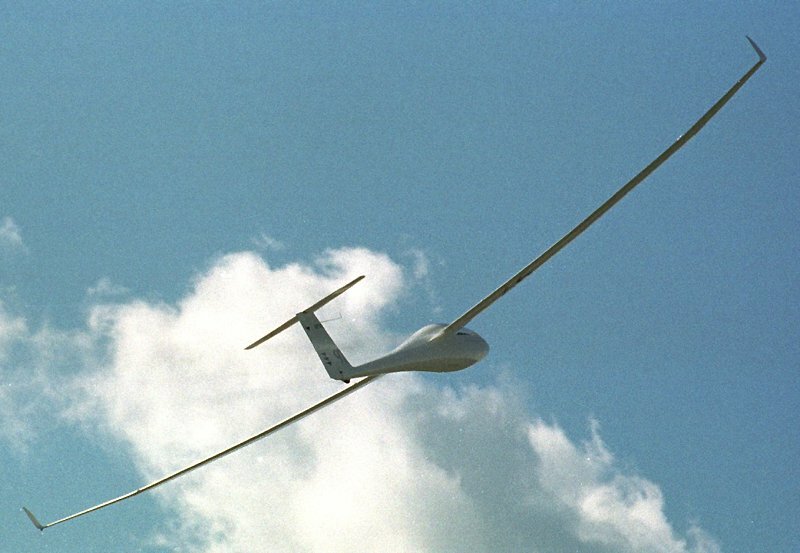 Gliders use rising columns of air called thermals to climb just as hawks and eagle do. 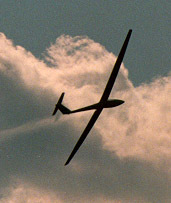 On a good soaring day each thermal is topped with a puffy cumulus cloud. 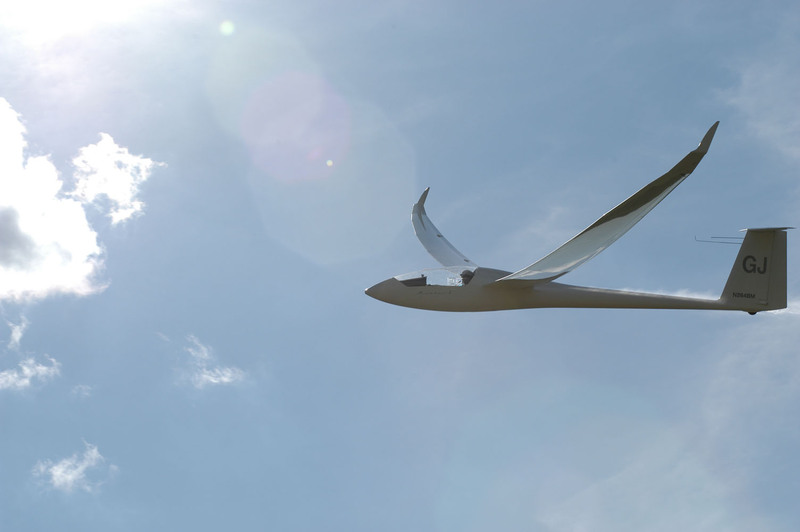 Cross-country progress is made by gliding between thermals. 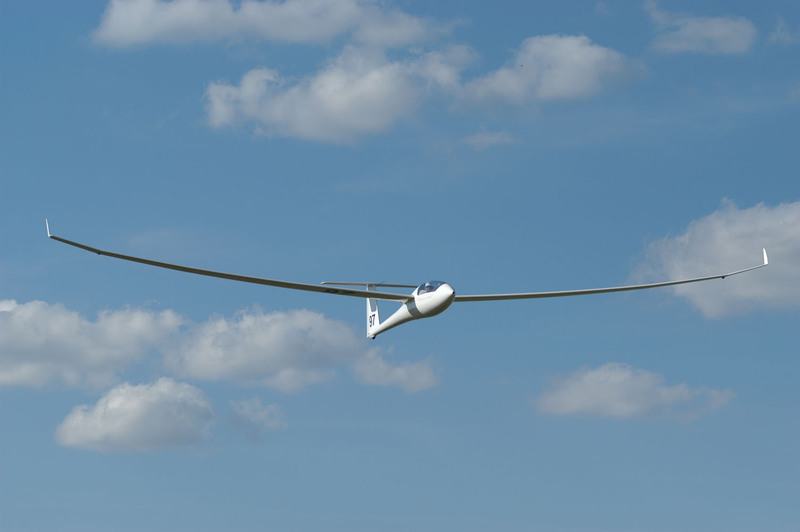 The gliders will stay near Albert Lea for a short time before exiting a 5 mile radius start cylinder and heading off on course. Tasks are usually pre-determined and range from 50 to 300 miles in length depending on the weather conditions. 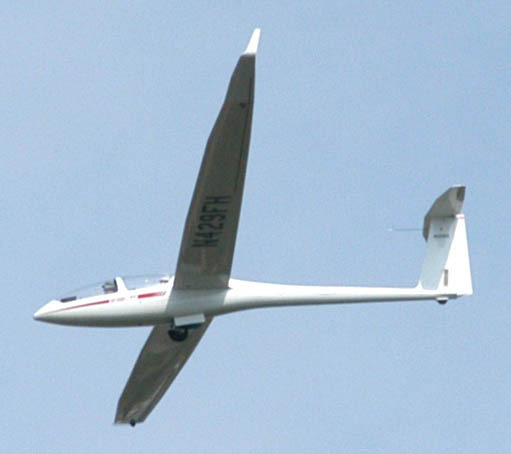 Some contest tasks are flexible and allow the pilot to vary the length of the course to match the strength of the soaring conditions. 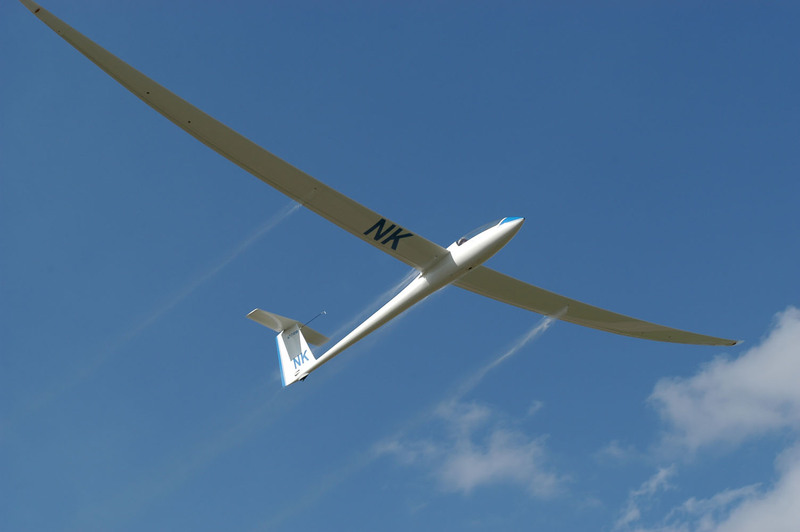 We use GPS flight recorders to verify that each sailplane flies to the required series of turnpoints. The pilot that achieves the fastest speed around the course wins. A pre-determined list of turnpoints is used which consists of airports and cities located in Southern Minnesota and Northern Iowa. 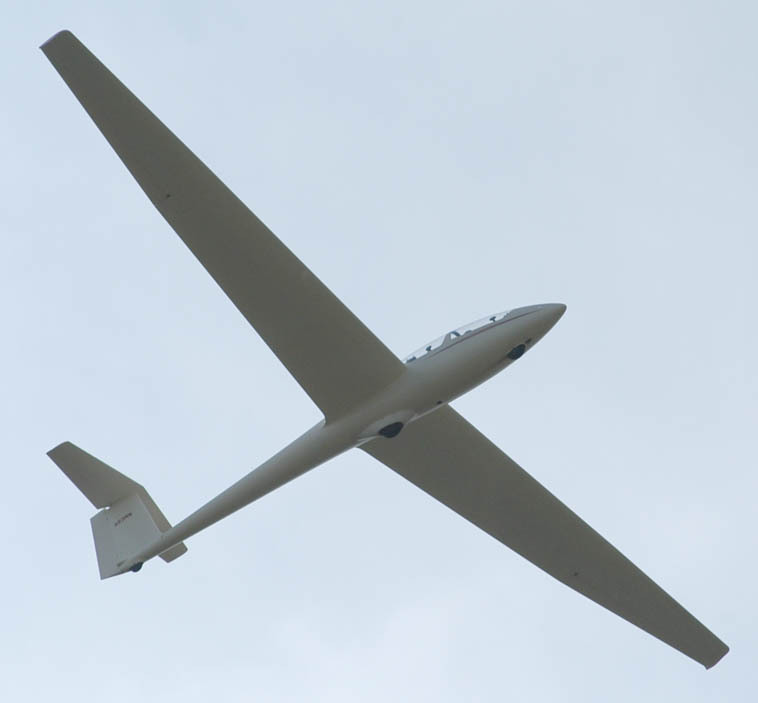 Toward the end of the day gliders will be returning to Albert Lea Airport sometime between around 4 PM and 6 PM. They must enter a finish cylinder with a 1 mile radius around the airport at a pre-defined minimum altitude of 1000 feet and land at the airport. Points are awarded based on speed achieved and the pilot with the most points at the end of the contest takes home the award for 1st place. 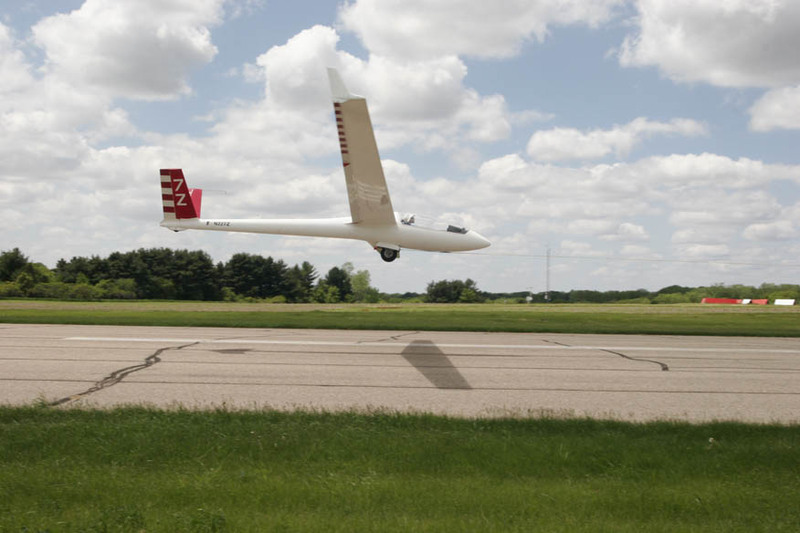 Sailplanes that don't complete the assigned course and land away from Albert Lea get distance points for the portion of the course they completed. 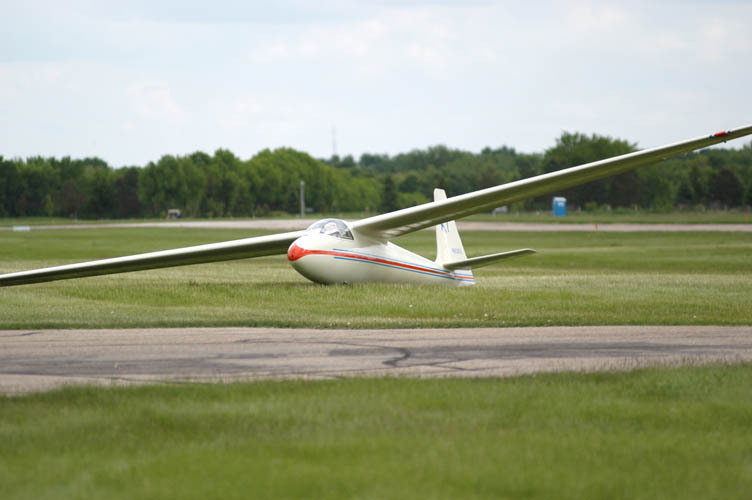 Southern Minnesota and Northern Iowa are ideal for soaring contests this time of year because the crops are low and gliders that get low while on course can land safely in just about any field. Visitors are welcome at the airport but safety dictates that visitors stay near the airport hangar buildings - well clear of the runways. 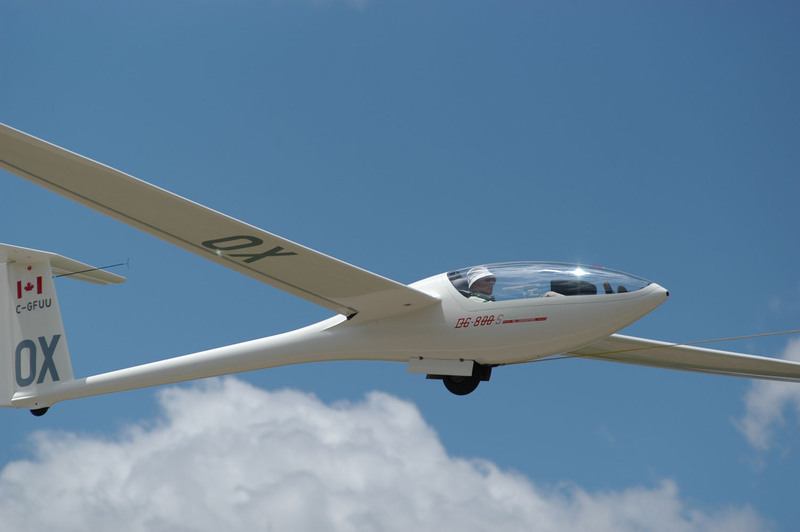 You will have a good view of the beauty of the sailplane race from that vantage point. 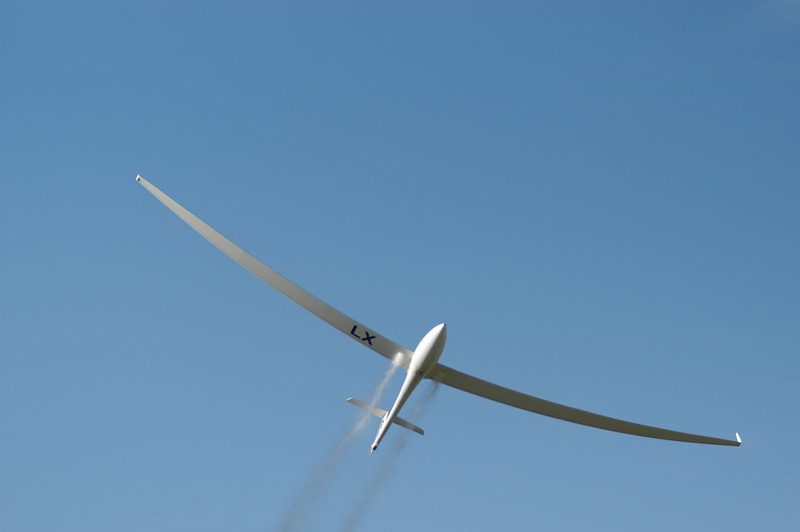 Sailplane racing is a very beautiful and intellectual sport. If you have never seen a soaring contest you should stop by and watch sometime. I (Paul Remde) will be the Contest Manager and Charlie Minner will be the Competition Director. This will be a contest to remember! 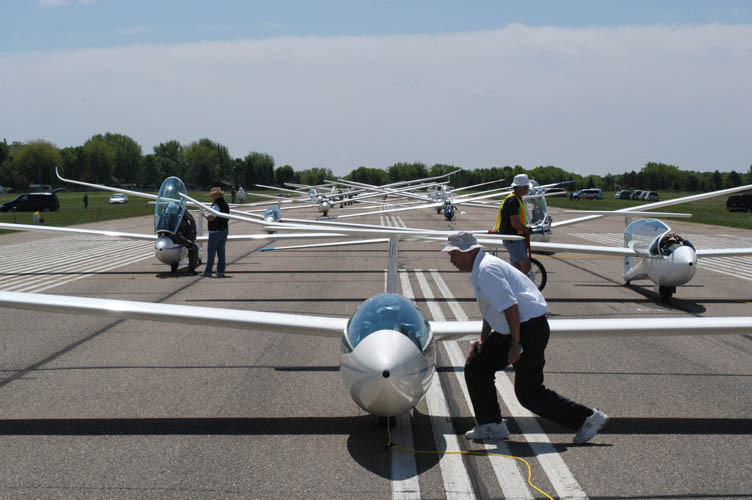 It will be the largest contest ever held at Albert Lea Airport and competitors will include some of the world's best soaring pilots. We are actively looking for many volunteers to help us run this big contest. 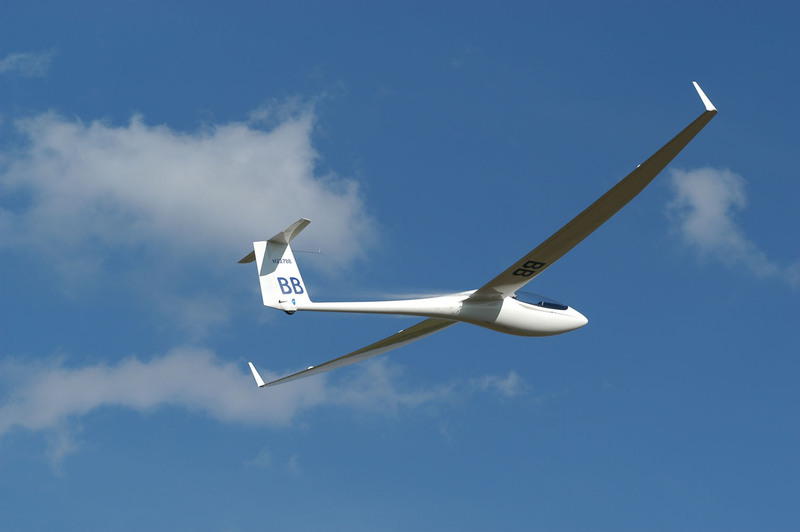 Please talk-it-up with soaring pilots in your area to encourage more glider pilots to come and help out. 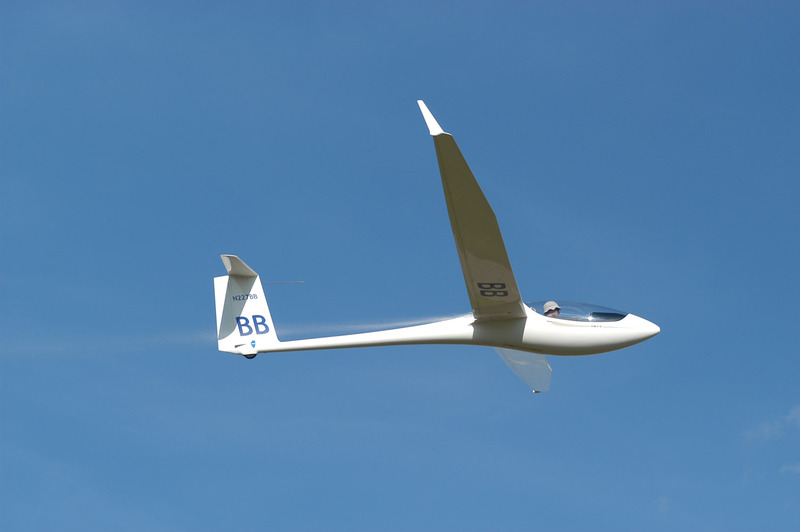 It is always fun being involved with a contest - especially a large one like this one with many of the worlds best glider pilots competing. 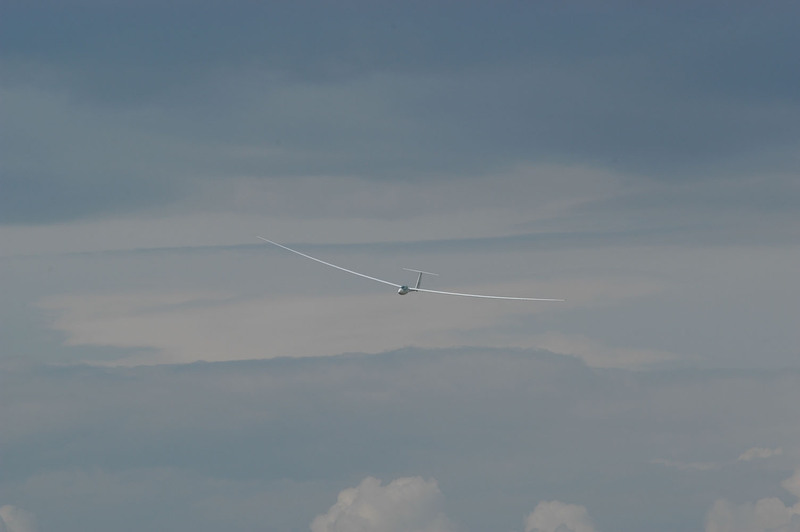 It is fun to rub elbows and learn from the experienced pilots and to see all the beautiful gliders. If you are lucky, you may even get signed-off to ride the beacon (You have to be there to appreciate how much fun it is to climb the beacon tower at night with a group of glider pilots and enjoy the view and camaraderie). Many great meals and bonfires are planned. You can see details on the volunteer positions on the Volunteers page. We have had some wonderful contests at Albert Lea in recent years and look forward to a fun contest. We would love to have you fly with us. If you have any questions or are planning to join us, please send me an e-mail. Please consider flying with us! A great team of volunteers (soaring spouses with hearts of gold) is busy planning social events for evenings and non-flying days. There will definitely be beer available in the main hangar after each day's flying is done. I for one love listening to stories of the days adventures over a cold beer and some chips and salsa. There are a number of good and inexpensive restaurants in the Albert Lea area. Cruises on the "Pelican Breeze"--a big pontoon boat available through the Chamber of Commerce. It accommodates about 35 people on a two-hour narrated cruise on Albert Lea Lake. 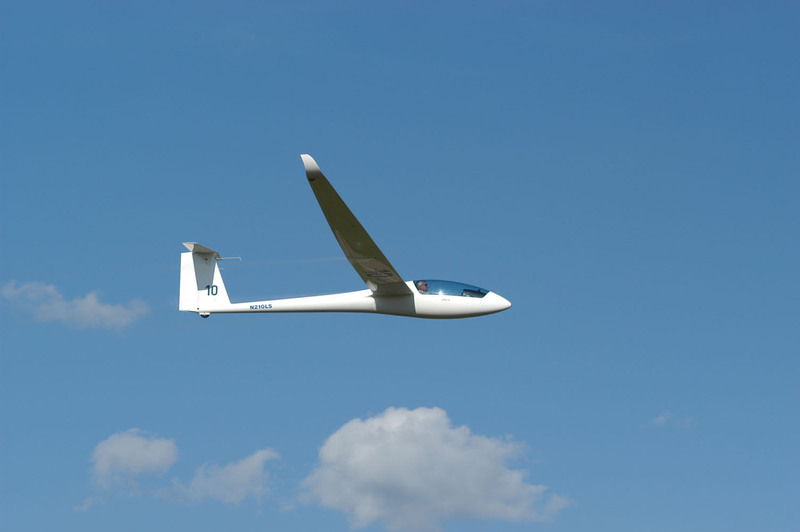 Spouses & kids can go during the day--perhaps booking sunset cruises for glider pilots. I know they do "pizza cruises"--don't know what their alcohol policy is. Check with the CVB. Bring bikes, rollerblades, etc. The area around the city lakes is lit at night now. The paved Blazing Star Trail is extended all the way to Big Island State Park. I'm looking for suggestions for ways to make this a fun and memorable contest. Jim Hanson (airport FBO and our awesome host) and all of the contest organizers really wants to have people talking about how great this contest was for many years to come. 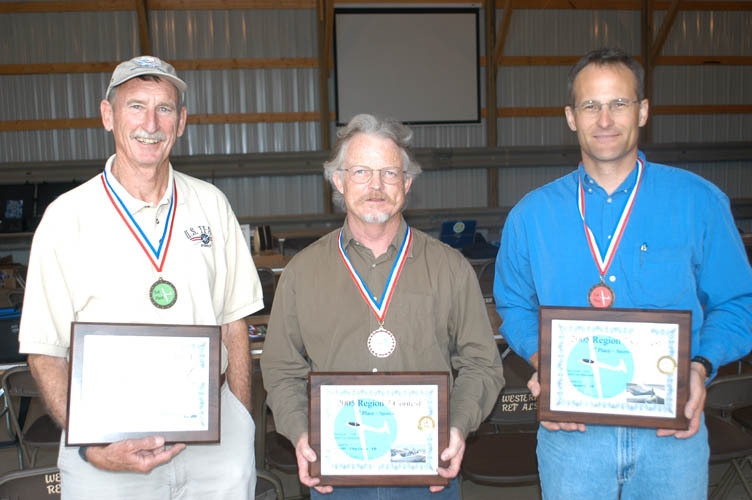 Certificate awards to the top 3 pilots in each class every day in addition to the awards for the overall contest winners. 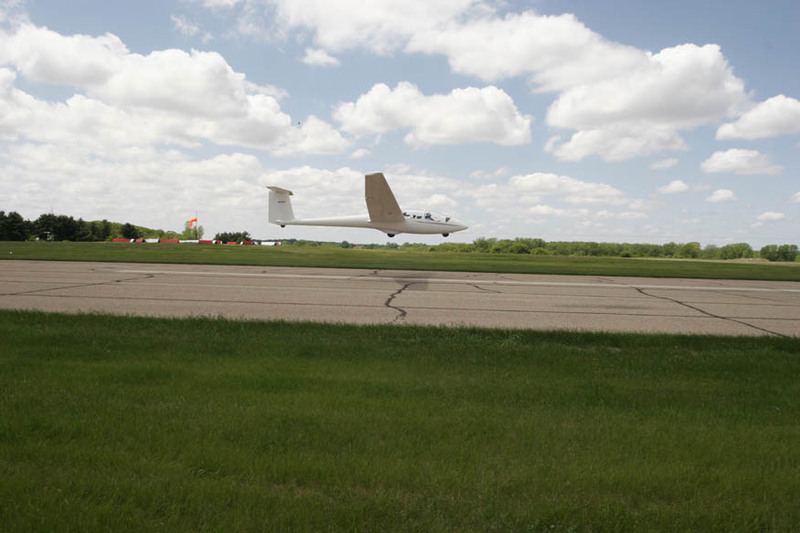 In the last 15 years, there have been 7 major soaring contests at the Albert Lea Airport. 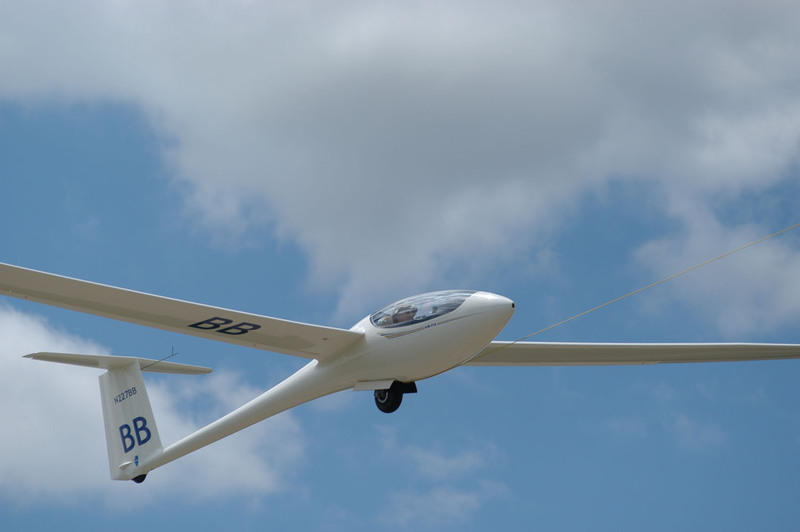 Below are links to books and articles related to contest flying and cross-country soaring. Pilot-Requirements.pdf - All competitors need to read this document. Pilot-Registration-Form.pdf - Please have this form filled out and signed when you arrive at the contest. Contest Rules - Please print and read the rules before you arrive at the contest. Handicap List - Used for Sports Class scoring. Flight-Line-Log.pdf - Log sheet for all flights, etc. You'll need 4 sectional maps - Omaha, Green Bay, Twin Cities, and Chicago (but you may be able to get by with only Omaha and Chicago). 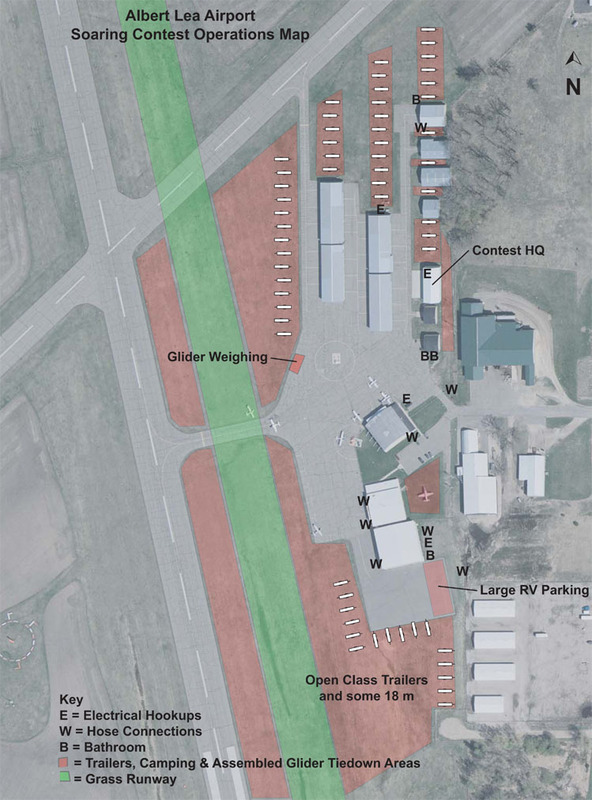 Below is a map of the airport with markings for locations to tie-down glider trailers, contest headquarters, etc. It is available as a jpeg file and a PDF file. 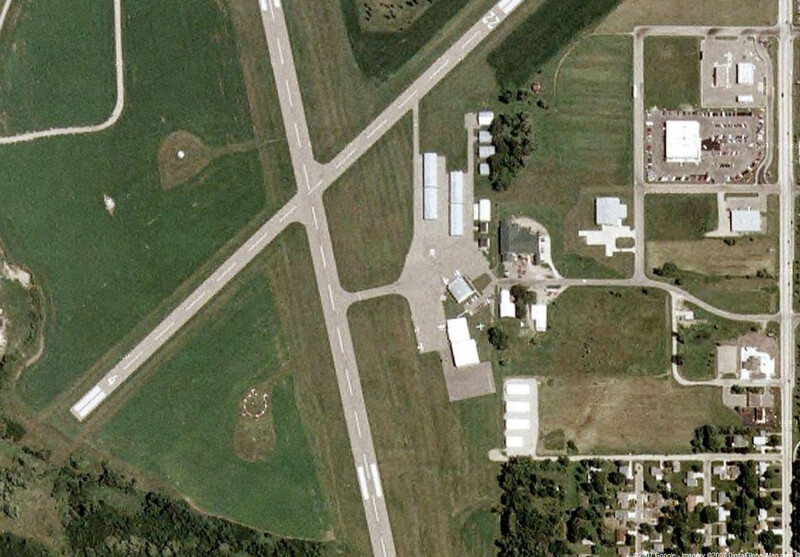 Below is a satellite image of the Albert Lea Airport with the grass runway and runway overrun highlighted. It is available as a jpeg file and a PDF file. 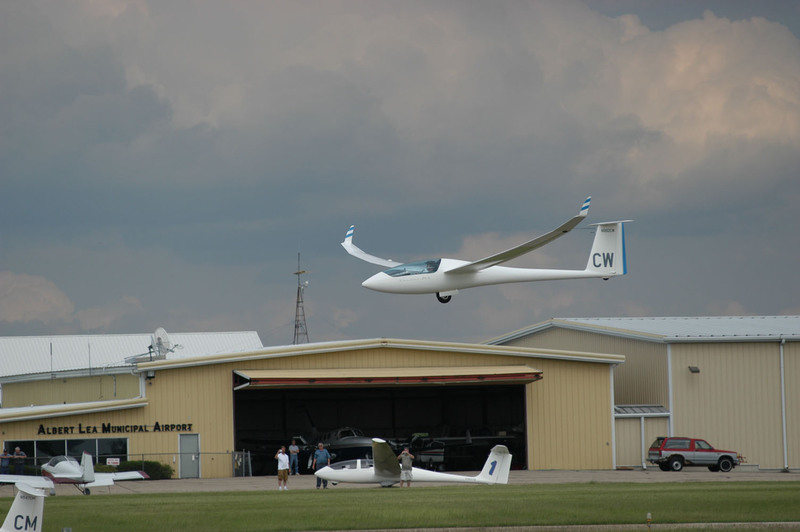 You don't have to be a seasoned soaring contest pilot to come join the fun of the regional contest. In fact, we welcome those who have never flown in a contest. We will be pairing new contest pilots with experienced "mentors". The mentors will answer any questions you have and most likely give you tips on how to fly faster. 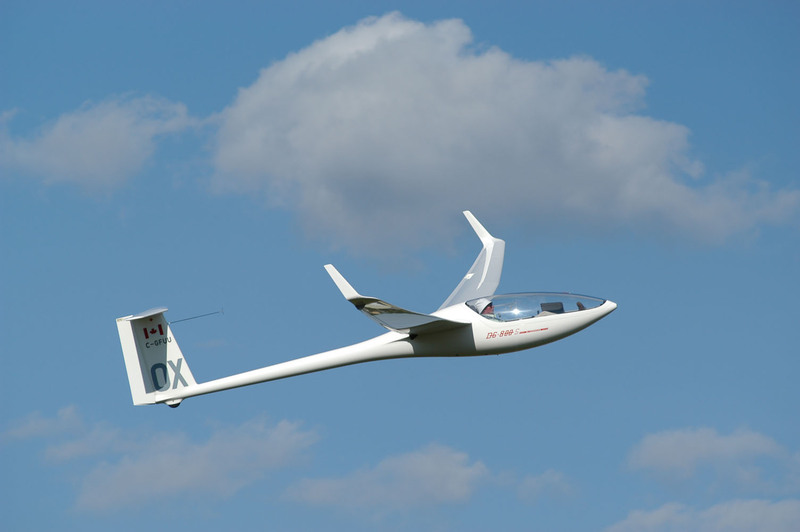 Even if you are not the competitive type, it's fun to set aside a week for cross-country soaring. 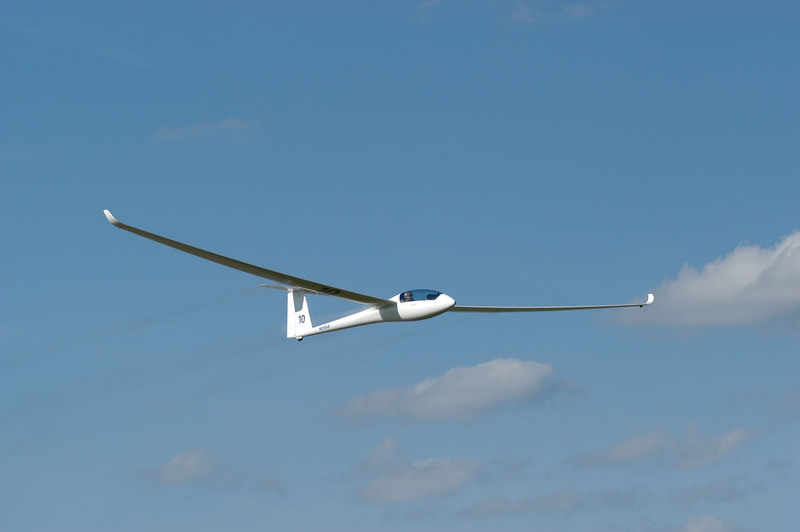 Also, you will be more likely to attempt (and probably complete) flights that you wouldn't have attempted if you were flying from your local gliderport. Seeing everyone else prepare, line up on the grid, and head off is a great motivator! It's also fun to see how your speeds improve over the course of the week. I really like the quote below from Doug Jacobs from an article in the September 2004 issue of Soaring entitled "Sugarbush XC/Racing Experience Camp". 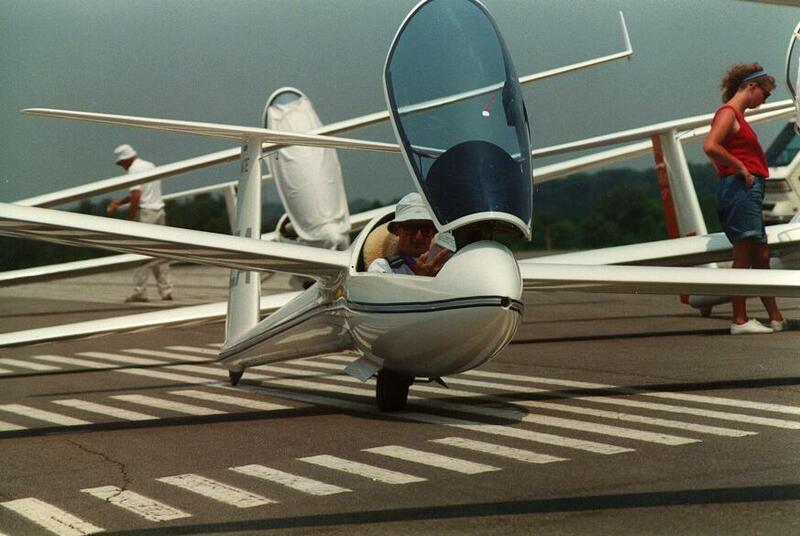 "Many a new cross-country pilot developing his or her skills will also want to sample the racing environment. Why? Different reasons for all but with one common thread - the experience of flying the same course with more practiced competitors represents a tremendous learning curve toward improving pilot capabilities. 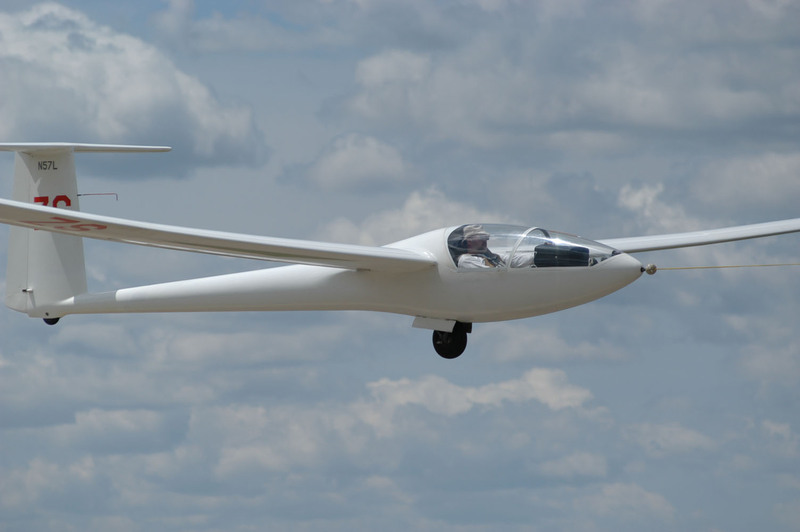 Most come back from their first competition raving about how much they learned, and immediately set about to put it into practice in their own flying." There is a good informational guide for those new to competition. 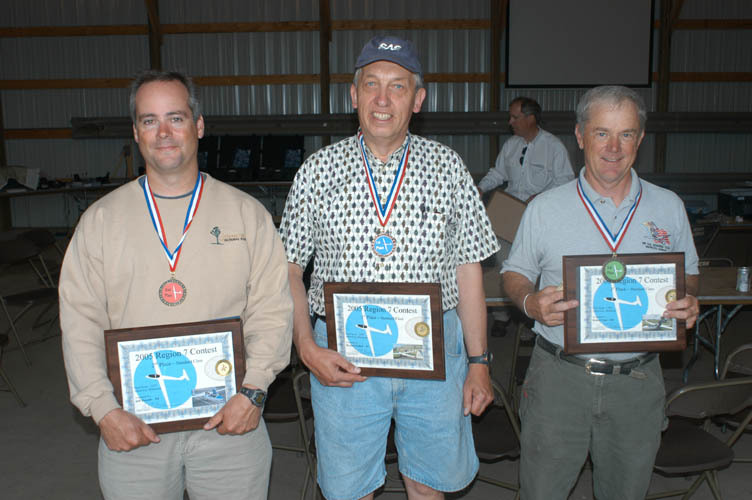 It is called the Sailplane Racing Association Guide to Competition. We can't make any promises about the weather, but our track record has been very good. 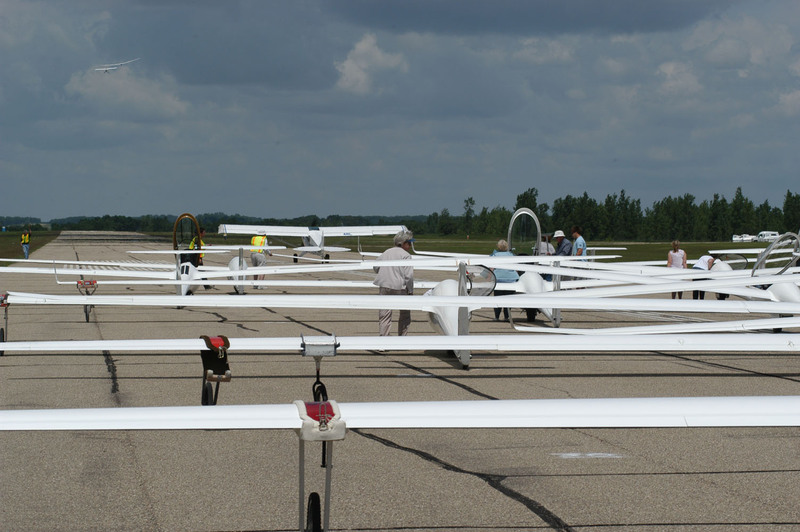 Of the 5 contests held at Albert Lea, 4 out of 5 of them were able to get enough flying days for a valid contest. We've also had some excellent soaring weather. At the 1997 15m Nationals Charlie Spratt sent the competitors off on a 270 mile task and everyone completed it! 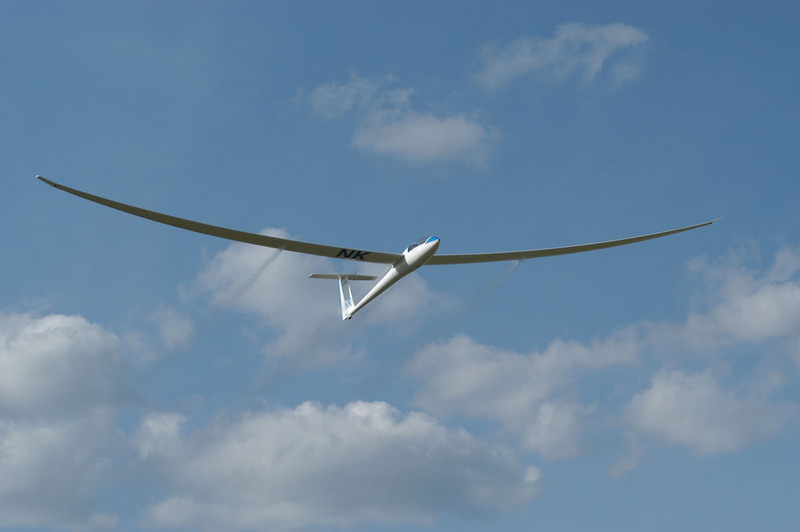 Pilots reported peak altitudes of 10,000 feet MSL (9,000 feet AGL) and the winner had an average speed of 87 mph! But wait... there's more! On day 3 they were tasked with a 307 mile task. All but 3 pilots made it around! I'm sure Charlie won't be setting such long tasks for this regional contest, but you can almost bank on a racking up some fun cross-country miles at this event. Below are some reports on the soaring conditions. Albert Lea is situated in southern Minnesota at the intersection of Interstate 90 and Interstate 35. 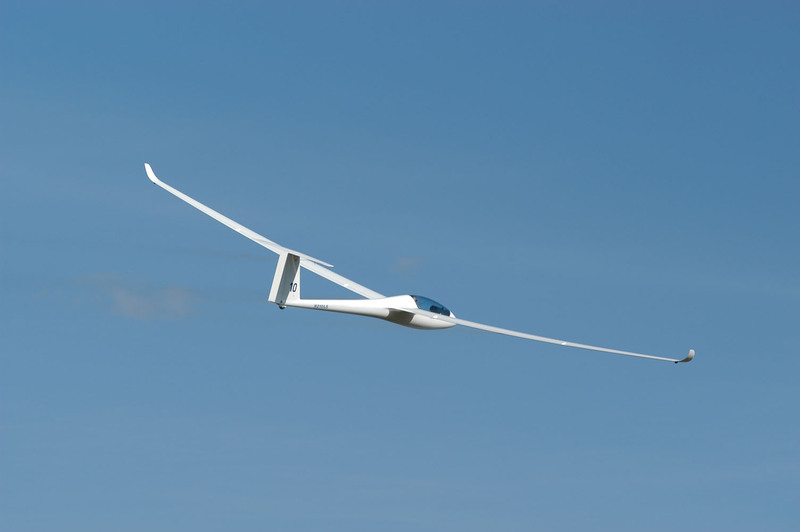 The airport is user-friendly and the locals really like soaring and soaring contests. Lakes, parks, golf courses, and other recreations are available locally. Less than one hundred miles to the north, the Minneapolis-St. Paul metropolitan area offers professional sports, museums, theatre, shopping at the Mall of America, and many other opportunities for you and your crew to relax and enjoy. Albert Lea is a nice town with a good attitude and a fine airport. The airport hospitality is second to none. 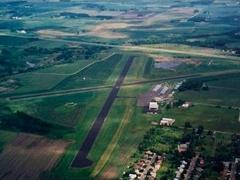 Albert Lea airport is situated in farm country which is either flat or gently rolling. Selection of suitable landout fields is not a problem in late May and early June as crops are low and large fields are available in all directions. Roads are uniformly good and are well-marked. Navigation is quite straightforward with prominent roads, section lines, and well-selected turnpoints (many turnpoints are airports). 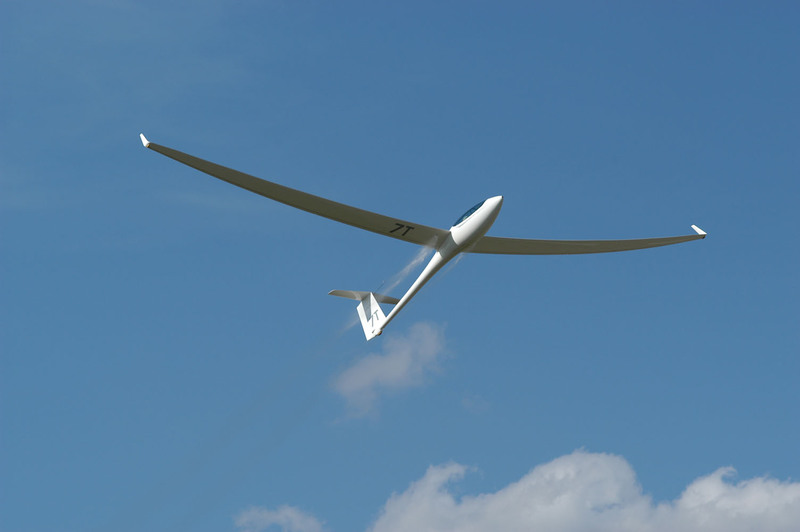 Airspace is not a problem; no turnpoint is situated in or near Class B, Class C, or Class D airspace. 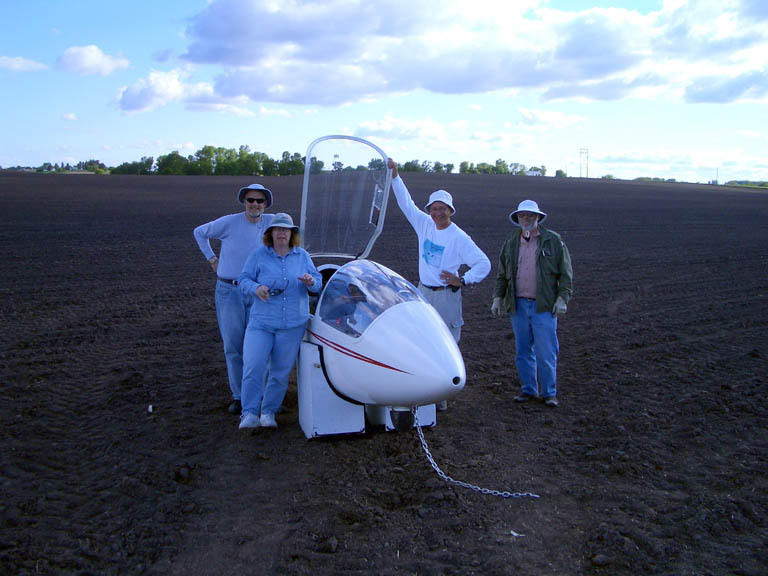 The June (and late May) climate in Minnesota is generally pleasant and varied and should present good soaring conditions. Daylight hours in late May and June are long at this northern latitude, with sunset occurring at about 9 p.m. or a little later, and twilight for an hour after that. First thermals appear at around 10:30 a.m. or so, with lots of heating going on by mid afternoon. Cool, dry, and unstable Canadian airmasses from the northwest generally bring dewpoints in the low fifties and daytime highs in the upper seventies to mid eighties, with bases of cumulous clouds often around 5000 to 8000 AGL and sometimes higher, and with visibility in the 20 to 30 mile range. Nights are generally comfortably cool in June. Occasionally Gulf of Mexico airmasses will intrude and bring higher dewpoints and lower visibility, but these incursions are generally infrequent and short-lived in June. The entire write-up is available here. 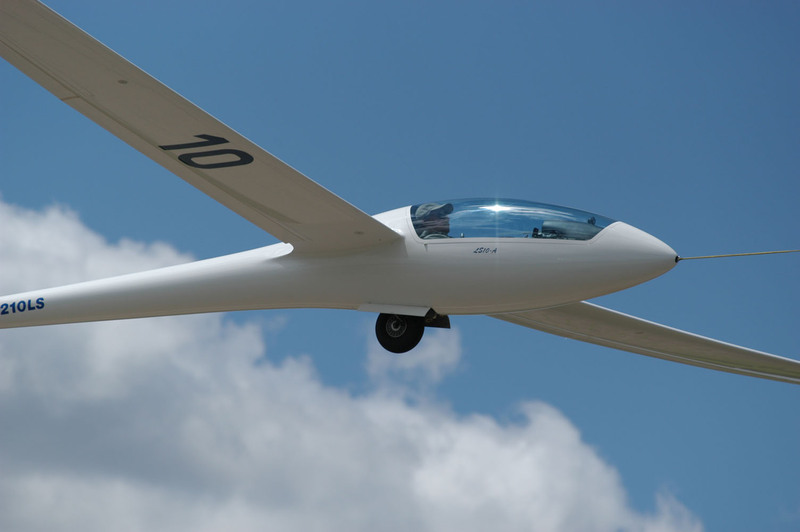 "Some of the best soaring fun I've had in a long time" : Gene Hammond. "I took one thermal to 8,800 AGL at eight knots to the top. Best I've seen in ten years": Rudy Mozer. "This place is good": Alfonso Jurado. 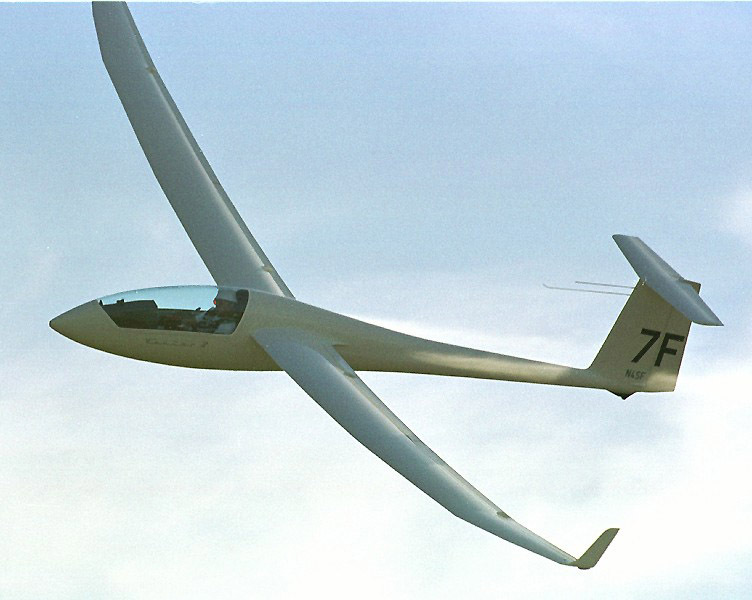 "This is a wonderful site with great soaring", said our friend from Down Under, Tom Gilbert. Charlie went on to write, "Albert Lea has everything we need in a race site, from free camping to plenty of water and a very friendly airport manager. The troops are working on a bid for an FAI bid in the near future; if it happens, don't pass it up. This is a wonderful place for the pilots and the crews." 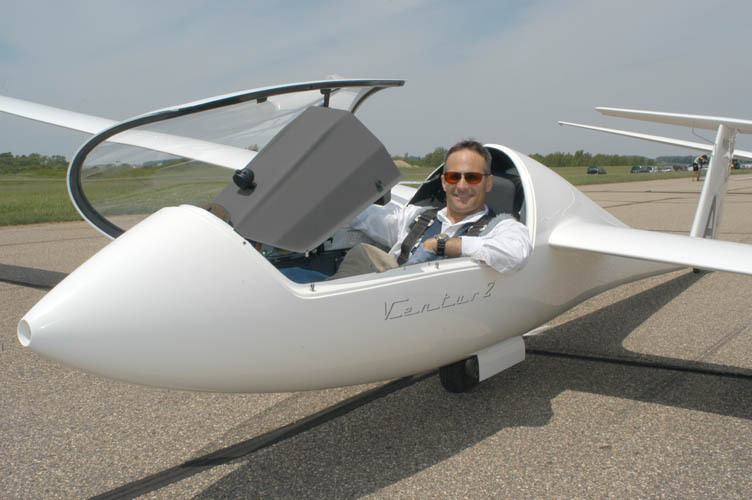 Tony Burton wrote in the Alberta Soaring Counsel's magazine ("ASCent") that "Albert Lea turned out to be a fine area for a contest. It's surrounded by gently rolling farmland with good thermalling - and landout - prospects. Navigation is easy with some major Interstates, several large lakes, and a north/south road grid to orient the pilot. 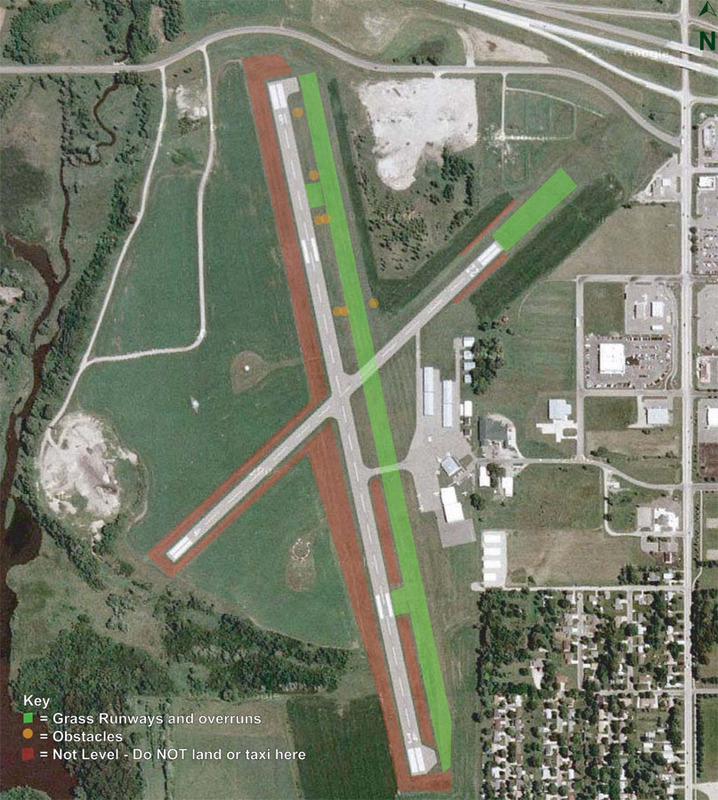 The airport featured two long runways, lots of ramp area, lots of grass for tiedown and camping, and a friendly and supportive airport manager." He also liked the warm Albert Lea hospitality, "A lovely taste was also the perpetual afternoon keg of draft beer in the hangar - a great inducement at the end of a flight to get your card and films in soon and to hang around and gather 'round to tell lies." Please register early for the contest. There will be a $50 late fee assessed if you register after March 30, 2007. To avoid the late fee you must both register on the SSA website and send in your $100 deposit. This contest is going to be a large one and the number of applicants may exceed the number of competitors we can accommodate. 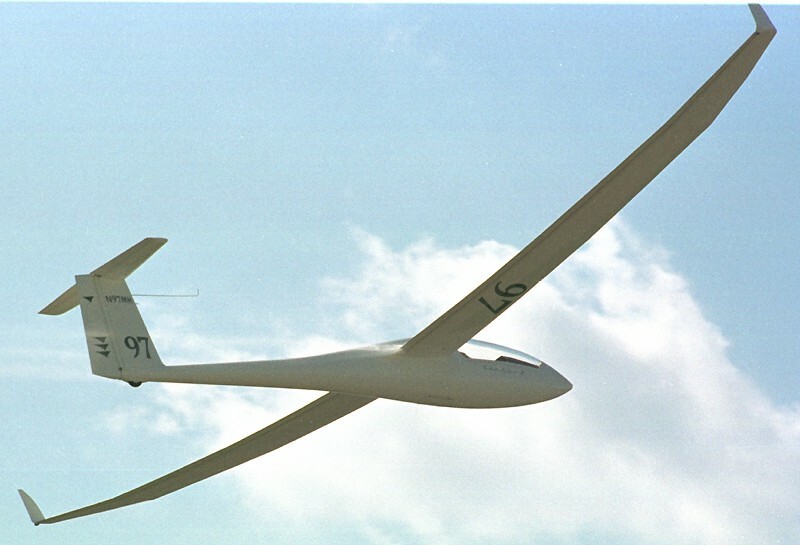 The rules state that we must limit the total number of gliders in all 3 contests to 65. The Preferential Entry Deadline is March 30th. Registrations received before that will be accepted in order of pilot ranking (as described in the rules). Applications received after that will be taken in the order they are received. Registration is available now on the SSA website on the following page: http://www.ssa.org/members/contestreports/Registeronline.asp. Please register early for the contest so that the team of volunteers will know how many people to expect. You will still need to sign the registration form when you arrive at the contest. Please send you $100 deposit ASAP (feel free to pay the full amount in advance) made out to Cumulus Soaring, Inc. to the address on the bottom of this web page. The deadline for canceling an entry with a full refund is May 15th, 2007 (14 days before the 1st contest day). After that date, money will be refunded at the discretion of the Contest Manager. I will do my best to arrange for a towplane to be at the Albert Lea Airport on Saturday, May 26th, but I can't make any guarantees at this time. That will be our setup day for the contest staff and I imagine many pilots will arrive on that day. 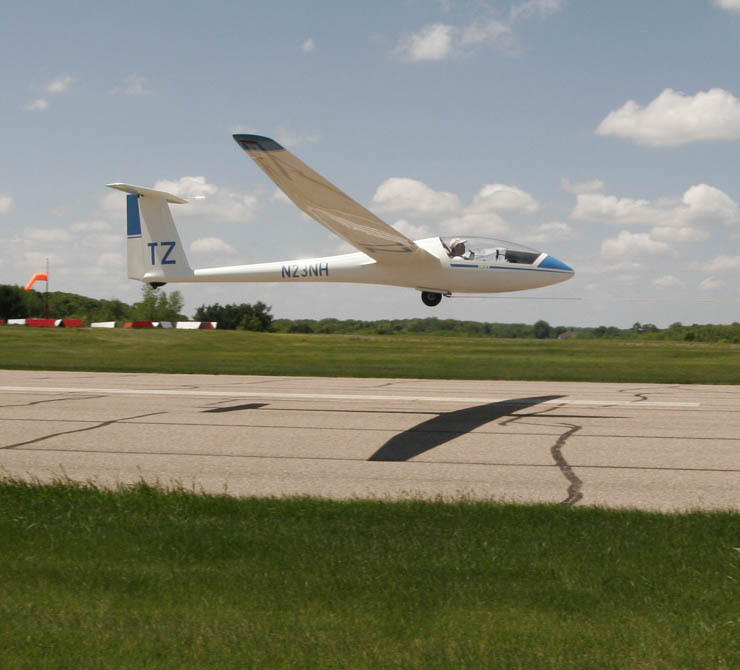 If you would like to fly in the area before the contest, you are welcome to fly from Cross Country Soaring, Inc. at Faribault Airport located about 30 miles North of Albert Lea. 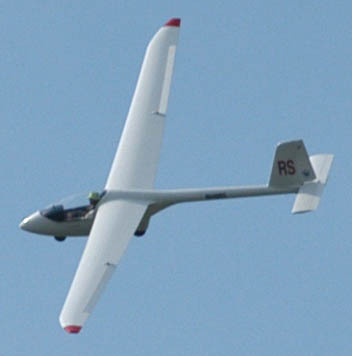 Pre-contest tows may also be available from Stanton Sport Aviation at Stanton Airfield. It is about 40 miles North of Albert Lea. Be sure to make arrangements with these operations before you arrive. Harry Thompson, (friend of Gray Tappan), Cessna 180 with 230 HP, - Yes - Only available for the first 5 days, maybe more. Stanton Sport Aviation, Super Cub (160 hp) - Hank Geisler and/or Kent Johnson, Yes - Monday, June 4th through Thursday, June 7th. 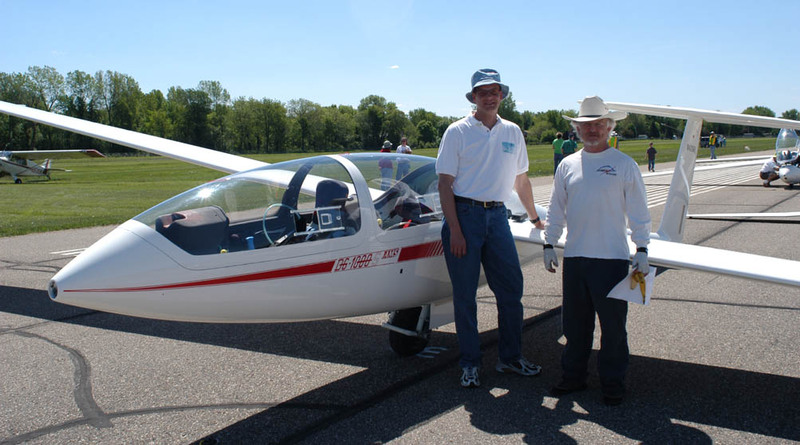 Joe Oye, SD, Citabria (150 hp) - Offered to tow June 2nd through June 7th, but at this point he is not needed. 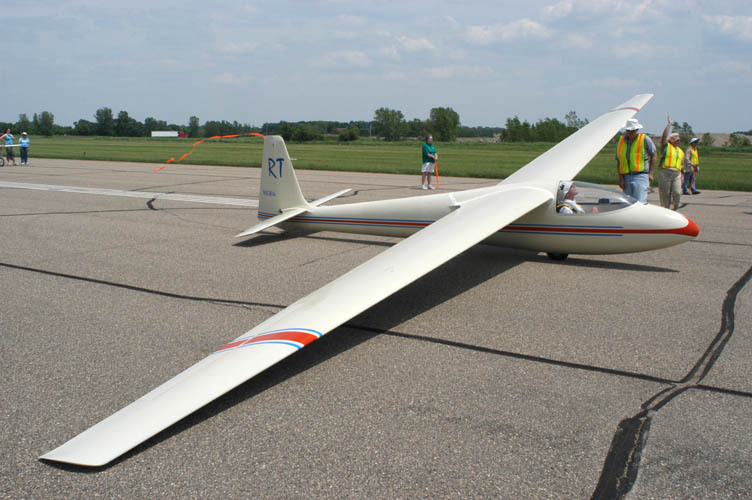 Silent Knights Soaring Club, Ames, IA, Supercub (150 hp), Terry Lankford - offered to tow Monday, June 4th through Thursday, June 7th but at this point their help is not needed. Safety will be an overriding consideration in every aspect of contest operations, for participants, guests, spectators, operators of non-contest aircraft, and for everyone on or off the airport whose safety may be affected by the contest. Safety rules and recommendations published by SSA for contests will be followed and enforced at this contest. Briefings for pilots, crews, and other personnel involved in operations will include discussion of safety issues and all those personnel will be asked to report any unsafe practices or recommendations to improve safety. This a "GPS Only" contest. Turnpoint photos will not be allowed for flight verification. The scoring team will be verifying flights by examining electronic flight logs. 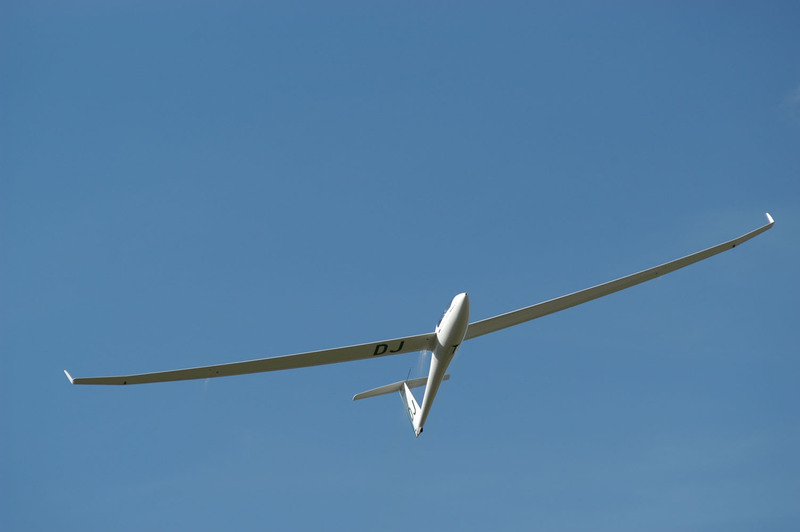 There are several types of flight loggers which will provide the data required. For more information, refer to rule 6.7.4. Every pilot must read the rules before the contest. 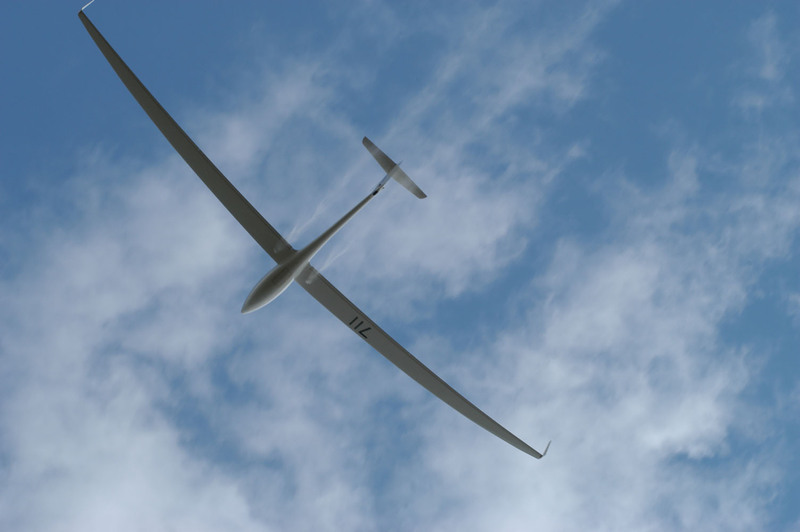 They are available here: http://sailplane-racing.org/rules.htm. 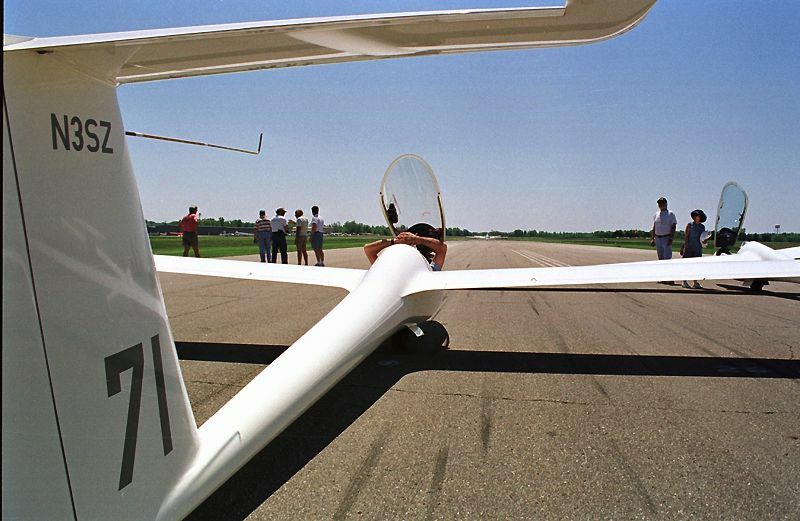 At previous some Albert Lea soaring contests, hangar space had been available for storing gliders each night. Unfortunately, Jim Hanson's space is full, and the main contest hangar will be filled with the towplanes. 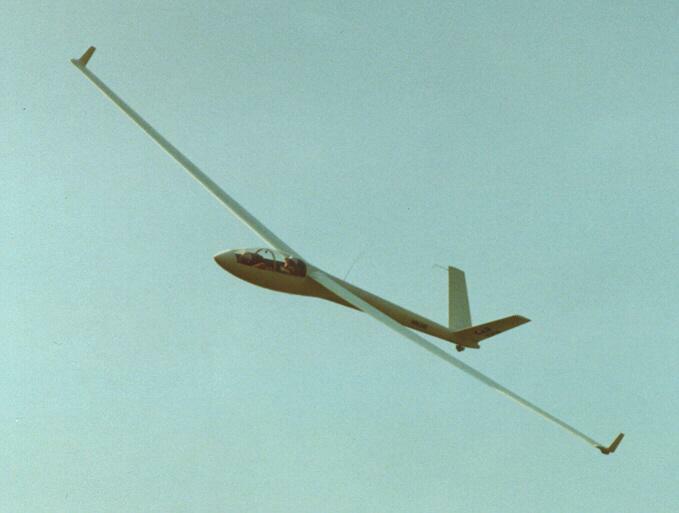 Therefore, contest pilots will have two options: store their gliders in their trailers, or tie them down outside. The contest fees shown below are the proposed ones for the 2007 contest season as set by the SSA contest committee. They are preliminary and pending approval at the board meeting at the SSA Convention. I have received permission from the contest committee to charge the extra $25 per/pilot fees (as mentioned in the rules) and an additional $5/tow to help cover towplane ferry costs and hotel room costs. Those extra fees are included in the numbers below. Regionals (2007 rates): $225 + 7 x $53/tow = $596, You will pay for 7 contest tows in advance and get a refund for unused tows after the contest. Practice day tows must be paid at the end of the practice day. Nationals (2007 rates): $325 + 10 x 53/tow = $855, You will pay for 10 contest tows in advance and get a refund for unused tows after the contest. Practice day tows must be paid at the end of the practice day. A deposit of $100 must be received along with the registration form by March 30, 2007 to avoid a $50 late fee. The remaining amount is due upon arrival at the contest, but early payment is kindly requested to help us cover pre-contest costs. The contest fee includes the SSA sanction fee of $45 (Regional Contest) or $60 (National Contest). Optional social events and dinners will be available at extra cost. 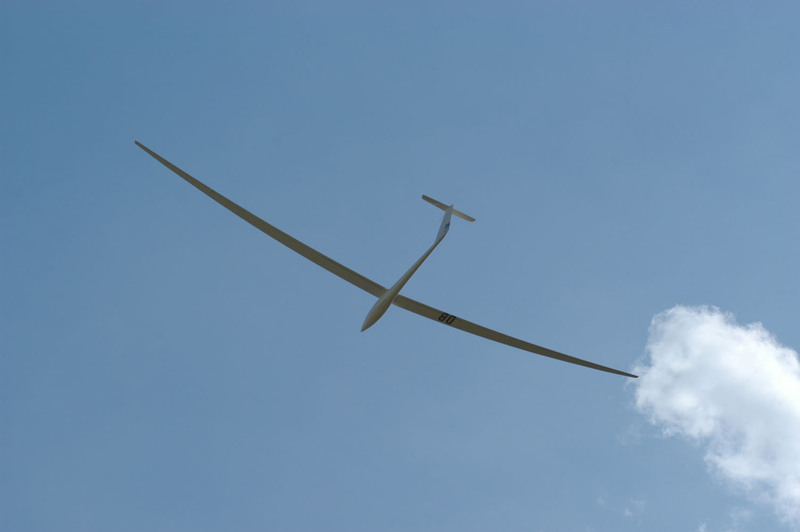 We hope you will come join us for the fun at the 2007 Albert Lea Soaring Contest!